It's been a true rollercoaster for supporters of Ruch Chorzów. 14-time champions of Poland had been lured for years with promises of return to glory with better management and potential relocation to 54,000-capacity Stadion Śląski. These promises ended with severe hangover last year, when the club's immense debt and irregularities were revealed and relegation from Ekstraklasa followed. Considered too modest three years ago, the city's proposal to build a new football-specific stadium is again on the table. 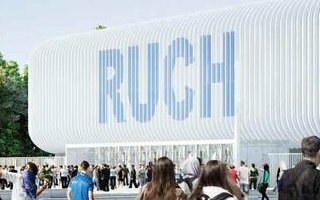 Though Ruch's previous management stood against it, it's now clear that the club would fail at gargantuan Śląski, already confirmed to have matchday lease price beyond Ruch's reach. One major change to the municipal stadium scheme has been made to satisfy supporters' demands. The arena was initially planned as 12+4, meaning 12,000 seats in initial layout and 4,000 more when demand grows. Now all 16,000 seats are to be delivered in the initial shape, even if still expected to be built one stand after another, depending on available funding. The city already has valid planning permission for the stadium, now the project manager needs to be appointed. This is precisely what the city council wll vote on this Thursday. If they approve transferring funds for this move, construction will be just a few steps away.